2016 - FOTY - itwasfree!!! Its kind of interesting info; the percentages are a decent range, but its hard to say where to draw the line from a normal race to a 'runaway' as they all range from the low 20s to the 40s. From the %s, each race appears to have been tight, except for a couple which broke the 50% mark. From here on out, im only posting those that broke the 50% mark. Again, no info from 2003 as those threads are long gone. Bronco Info: 1986 Bronco XLT, 302 5.0L V8. Warn premiums, Serp. and Sag swap, 3G, F350 Brakes. I was thinking this would be cool but I was thinking as an addition to people's profiles. Kind of like jet pilots/football players having kill icons on their helmets or like achievement icons on Xbox live. Have a simple icon with the month and year that the person won (or maybe a different color and just the year for FOTY). But then I thought about it a little more and realized there are surely better things people could work on to improve the site... Plus this list is good enough. It something ive worked on for a while. Tried to do 6 months at a time to make it easier on myself, and then once i had all the info, typed it all up. Just coincidence that you posted that other thread, got me motivated to type this up and post it. too bad I am not SrATEX anymore haha...but good work Kev. That is one dedicated individual. Nice work on all those statistics. I can't help but be disappointed when I see past winners that have either sold their bronco or are not longer active on FSB for one reason or another. Yeah, i count about 10 or so who either disappeared or have sold their rigs. For the first year, after the voting was done, the 'Vote' thread was deleted, and a 'Congrats' thread started. Starting in '04 the powers that be decided instead of deleting them to just lock them. You know a DUI can fix that! 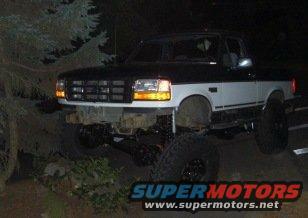 91 Ford F350-- 8" 39s going bigger! 1998 Jeep Wrangler, 5.5" lift, wheels, tires and all the other cool stuff. there should be one more on by 3 votes, archer66 in December. How about largest percent of votes for winners? Should be able to finish it when i get home from work.